When you started your compost pile, you may have worried about attracting mice and rats. But here’s a new concern: coyotes. 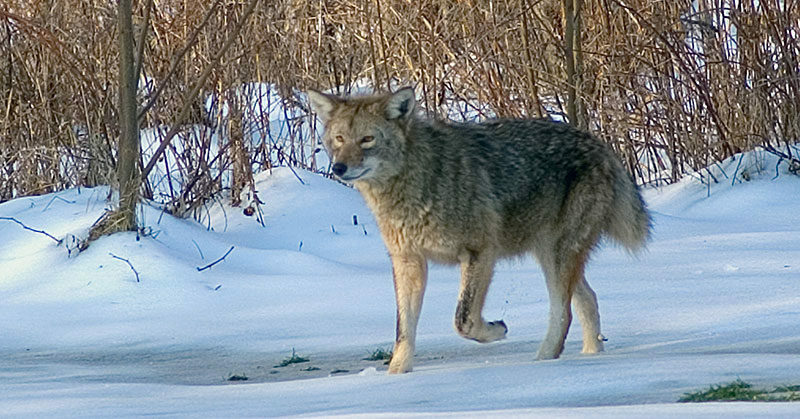 Eastern coyotes are well adapted to suburban and even some urban environments. They are becoming a more common sight to gardeners in Western New York, and you don’t want to attract them to your yard. One thing gardeners can do is to enclose compost piles so coyotes can’t get at them. That’s a tip from the New York State Department of Environmental Conservation (DEC). You don’t need anything fancy for a compost bin. A garbage can with a tight-fitting lid can deter pests. One Buffalo gardener drilled holes in a garbage can to help air circulate, which speeds up the decomposition process. You can also buy compost bins. A sale is under way now, sponsored by Erie County in partnership with the Western New York Storm water Coalition, the City of Buffalo and the Town of Wheatfield. In most cases, coyotes avoid people as much as possible. However, if coyotes learn to associate people with food, such as in compost piles, in garbage cans or dishes of pet food, they may lose their natural fear of humans. This increases the risk for close encounters and conflicts. At this time of year, the DEC sees an uptick in questions regarding coyotes because with warmer weather coming, resident coyotes set up dens, and they tend to be territorial around the dens. The pups arrive in spring, and coyotes forage almost constantly from spring to mid-summer to provide food for the pups. That’s the period when the coyotes will be most territorial. That’s why the DEC recommends keeping your compost enclosed. Also make sure your garbage is covered and refrain from feeding your pets outside. Don’t feed coyotes. Discourage other people from feeding them. Make garbage inaccessible to coyotes. Eliminate the availability of bird seed. Concentrations of birds and rodents that come to feeders can attract coyotes. If you see a coyote near your birdfeeder, clean up waste seed and spillage. Don’t allow coyotes to approach people or pets. Don’t allow pets to run free. Supervise all outdoor pets to keep them safe from coyotes and other wildlife, especially at sunset and at night. Small dogs and cats are especially vulnerable to coyotes. Small dogs are at the greatest risk of being harmed or killed when coyotes are being territorial during denning and pup-rearing. Small dogs should not be left unattended in backyards at night and should remain supervised. Owners of large- and medium-sized dogs have less to worry about but should still take precautions. Fence yards to help deter coyotes. The fence should be tight to the ground, preferably extending six inches below ground level and taller than four feet. Be aggressive in behavior if you see a coyote: Stand tall and hold your arms out to look large. If a coyote lingers for too long, make loud noises, wave your arms, and throw sticks and stones. You don’t need to be concerned if you see a coyote occasionally throughout the year. If coyotes are seen repeatedly during the daytime near homes, follow the DEC’s recommendations to prevent problems. However, if coyote behavior remains unchanged or a coyote becomes bold or threatening, contact your local police department and your DEC regional office for assistance. This may indicate that some individual coyotes have lost their fear of people and there is a greater risk for problems to occur. Plantasia kicks off Wednesday with gardenscapes, flower show & moreThere’s still time to enter our great prize drawing; tell your friends!